The Crusader is overall a very simple aircraft to fly. With all of the wind tunnel testing, there aren’t many surprises. 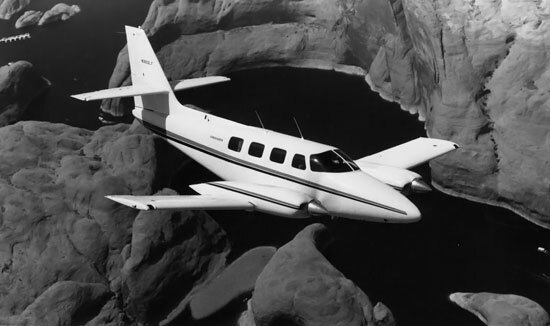 Cessna saw great success with their 1953 Cessna 310 light twin. For decades it rolled off the production line as a trainer, personal aircraft, and business commuter. It had been through so many variations that pilots joked they were running out of letters of the alphabet. The only other “new” twins to come out of Cessna during that time were heavier pressurized commuter aircraft. 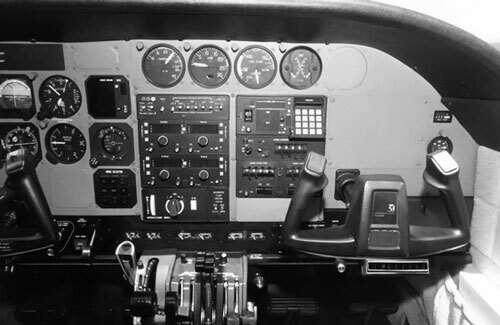 The need arose to replace their 310 with something more modern and keep a hold on the twin trainer market that Beech and Piper were dominating. Enter the Cessna T303 Crusader. Cessna’s replacement for the 310 was another four-seat low-wing aircraft, powered by two four-cylinder Lycoming 160 hp O320 piston engines. This Cessna 303 Clipper first flew in 1978, and the first flights weren’t pretty. 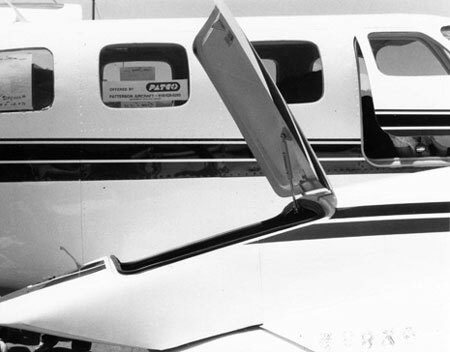 Cessna had used a new NASA-designed airfoil for the wings, but there were still some big problems with performance and stability. In addition, after the first flight, market research showed that there just wasn’t a demand for four-seat twins anymore. Everyone wanted a plane that could carry more load than what the 303 could offer, and Cessna abandoned development of the Clipper. Cessna re-attacked this design the following year. They made the cabin larger to hold six people, and with that were obliged to add some larger engines. A turbocharged 250 hp Continental TSIO-520-AE six-piston engine was added to each wing, which kept the same NASA airfoil design. The engines featured counterrotating propellers, eliminating all critical engine limitations for single engine operation. This aircraft was renamed the Crusader; PanAm still held rights to the Clipper name and Cessna wanted to avoid any legal troubles. Nothing was spared during development. As a result, this new aircraft underwent extensive wind tunnel testing for the next couple of years, finding every single little disturbed airstream. Control surfaces and fairings were slightly modified over and over, and the horizontal tail was moved halfway up the vertical tail to address prop wash concerns. This “crescent tail” would become the identifying feature of the 303. The first deliveries of the aircraft started in late 1981. The Cessna T303 Crusader would, unfortunately, succumb to market dynamics just as the Clipper did, but not before 297 aircraft were produced. In 1984 there just wasn’t a demand for GA twin piston aircraft – in fact, the entire GA market was suffering. Production ceased that year. The Crusader is overall a very simple aircraft to fly. And because of all of the wind tunnel testing, there aren’t many surprises. Really the only one that pilots regularly mention is pitch control throughout the entire flight envelope. A lot of backstick pressure is required to get the nose off of the runway at takeoff, and then without much warning, it just jumps into the air! Pilots then have to ease forward to get the nose back down to takeoff attitude. The gear configuration is partly to blame for this; the mains are located well aft to keep the aircraft from tipping onto its tail when CG is at the back of the envelope. Entry into the T303 Crusader is much simpler than comparable low-wing six-seat light twins. These other aircraft usually require climbing over a wing and then a seat or two to get into the passenger cabin. The Crusader is equipped with air stairs, giving it more of a corporate jet feel. Passengers then enter a roomy cabin with seats in the club configuration. A stowaway table permits eating, working, or playing cards. The cockpit can be separated from the passenger cabin with a small curtain. The cockpit is very large and spacious. There is a lot of shoulder room up there as well as excellent visibility with the wraparound windshield. The instrument panel is huge and almost looks empty in delivery aircraft without a lot of avionics upgrades. 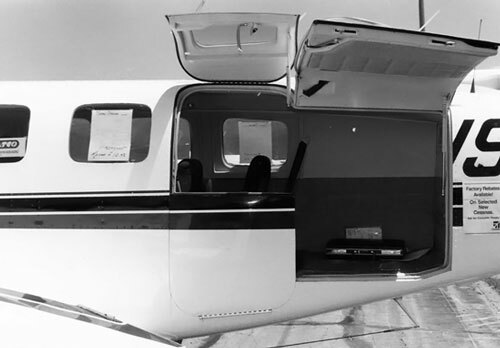 The Cessna T303 Crusader has ample storage space. There is a storage compartment in the nose, tail and uniquely in each of the wings. You won’t find that it all gets used – the Crusader is still underpowered, and you can carry either passengers, cargo, or fuel. But not all three. Cessna had plans to upgrade to bigger engines but they were forced to cease production before the enhancement. Endurance is over five hours with a full 153 gallons of fuel. But with a useful load of 1,845 pounds, full wing tanks will only leave 820 pounds for passengers and cargo. The Crusader cruises right around 170 knots with an average consumption of 25 gallons per hour. At sea level on a standard day and moderate load, the Crusader will climb at 1,000 feet per minute but this drops drastically with altitude and load. And with one engine you’ll be lucky to climb at all. Cessna’s specs will show a single-engine climb rate of 250 feet per minute at sea level on a standard day, but pilots have reported that the reality is much less. 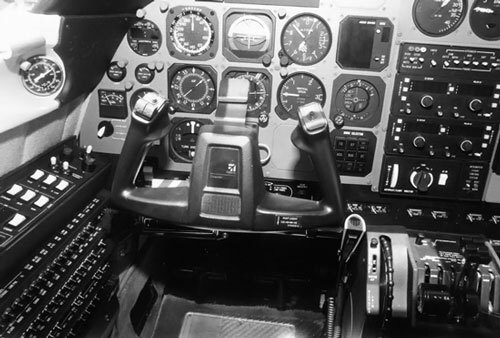 Cessna had a lot of potential with the T303 Crusader. The initial design had a lot of bugs worked out, with the exception of being underpowered, but Cessna was ready to address that. There were hardly any changes at all to the base model during the entire short-lived production run – just the addition of optional deicing equipment and some small changes to the cabin configuration. Unfortunately, it fell victim to the market. Current 303 owners still love their Crusaders, with the exception of one big piece of airplane ownership – sourcing of spare parts. There’s not much out there due to the short production run! What Are the Cessna T303 Crusader’s Specs? Why Give a Pilot a Night Rating and Not Let Them Use It? I used to train multi-engine students in the Cessna 303 Crusader and loved every minute of flying this aircraft. Spacious, easy to fly, and great looks. Those Continental TSIO-520’s put out an awesome sound and you knew when a Crusader was taxiing. I can still tell a Crusader flying by just by those engines! Great airplane with great handling and great comfort for both pilot and passengers. One of my favorite Cessna aircraft! The Crusader was a fun airplane to fly. I did my Commercial multi training in it. Mike I think I flew with you at Riddle way back in the day around 1990-91. After the 310 came the 320, then the 401/2 and 411/420. I have a Crusader .Had other twins in the past and found that the T303 is one of the easiest to fly . and six people . When you stop at different airport people ask who makes it and what is it. When I go to fly-in people wan’t to take pictures of it . The Crusader is a result of all the design work Cessna did for it’s last twin, leaving all the bigger twins’ squawks behind, like complicated fuel systems, reducing pilot workload. It adopted latest Big Twins’ Trailing Link landing gear, allowing softer landings and smooth unprepared runway operations. Most of them were equipped with all the Bells & Whistles, our ‘82 Model has Radar, A/P, De-Ice and more. Later models added A/C, although at a high weight Cost. It’s a well “balanced” airplane regarding the engines’ power output. Just do your correct weight & balance. I’ve owned one for a few years and have loaded 6 on board, and 2 hours of fuel + reserve, of a 2.400FT unpaved runway. The Crusader has flawless handling characteristics, especially at low speeds, it’s very predictable! “Nose heavy Feeling” on ground is true, particularly if you “force” the plane off the ground on short take-offs, but a bit of practice will get you used to it. It’s not a speedster, although it will True 175KTS, but definitely a very versatile, comfortable, safe and easy to fly twin! Crusader owners will hardly get rid of theirs. Serial Numbers go up to 315, not sure if all were “delivered”. Safe Flying! !